A SPECIAL Informanté investigation into the suicide of Elna-Marie Abbott, whose decapitated body was found on a railway line in Windhoek, revealed how the “fake news” phenomenon on various social media platforms sent the nation on a frenzied search for a male murderer. Even after a finding of suicide – after painstakingly investigations by top detectives of the Namibian police and the assistance of an uncle of the deceased – the police was still accused of not doing their job, with an apparent murderer still on the loose. 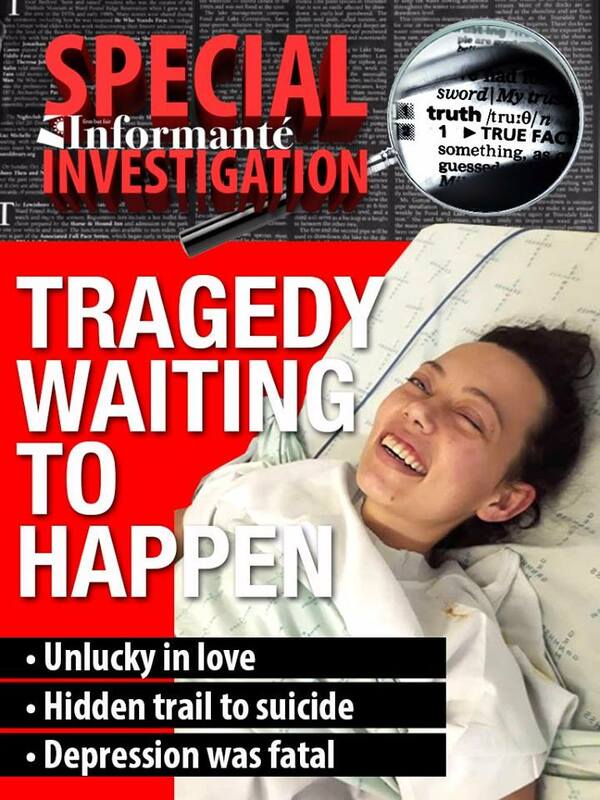 A lid of silence by the family, who possessed evidence of a history of Abbott’s depression and troubled relationships with well-known gay women, complicated the investigation, while a threatening SMS-message by a “South-African” man on the cell phone on the day of her suicide complicated the investigations even further and created a media firestorm on various Facebook and WhatsApp platforms. Since the discovery of the gruesome scene on the railway tracks in the heart of Windhoek, a search was on for the male caller, while the threat was indeed issued by a Namibian female doctor warning Abbott of physical violence if she persists in seeing the girlfriend of the doctor who is also employed in the medical field. The call from a South African number was made by the doctor on her way back home. Further evidence of a possible love-triangle involving Abbott was found on CCTV at a Pioneerspark petrol station where the suicide victim and one of the female medical practitioners were in a physical fight. The same video was also later used to confirm the identity of Abbott by matching the visuals with the car that was found at the Merensky Towers containing the suicide notes. For at least 72 hours, the nation believed that a man had killed the unfortunate Abbott, while the small and protective lesbian and gay society remained silent even when it was clear and common knowledge in the closely knitted community that Abbott was unlucky in love and suffered depression that had been treated unsuccessfully until her sudden decision to execute the most horrific suicide in recent memory. In a bizarre twist of events, a self-appointed Sherriff Marshall ranger, one Sean Naudé, was forcefully removed from what was still a crime scene by a well-known reservist, Lodewyk van Graan, inflaming a vicious Facebook debate on interference with a crime scene. Van Graan responded to Naudé’s attack by describing him as a self-publicity seeker with a sordid past. Naudé claims that he was a “first respondent” on the scene and had waited two hours for the police to take control of the gruesome discovery. Non-stop investigations distinguishing facts from fiction eventually came to the conclusion that Abbott committed suicide. Her uncle, who was one of the most vocal denialists of suicide, because she was “such a happy person”, failed to inform the social media audience that he had indeed taken care of her after a failed suicide attempt last year that landed her in a coma for three weeks while doctors fought for her life. On Monday, the uncle admitted that he was wrong and that he was convinced by the police investigations that suicide was indeed the cause. The missing car that was initially implied as stolen contained several suicide letters that assisted in solving the mystery of the suicide, which was condemned initially as a murder most foul. Informanté can now also reveal that Abbott, who resigned from the Marigold Hotel at the end of February this year, applied for a job at one of Namibia’s foremost hospitality establishments on the same day she committed suicide. An impressive CV reveals that she was always regarded as a model employee wherever she worked. Most of the companies expressed regret when she was leaving their employment. The silver VW Golf that she left at the Merensky Towers in the central business district of the Namibian capital on the afternoon of 28 March, contained a plethora of information and clues that led investigators to the conclusion that she did indeed commit suicide a few hours later. 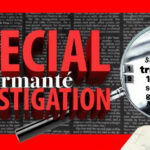 Using all available surveillance technology, detectives were able to track and reconstruct the deceased person’s movements in the 48 hours preceding her lonely, sudden and violent death on the Thursday evening. On Wednesday, 27 March, between 14:00 and 15:00, two days before her body was found, Abbott went to a well-known tyre shop, Tyrerack, to get her car’s wheel alignment and balancing done. It was the same day she delivered her CV to apply for a new job. She fixed her tyre in anticipation of travelling to Tsumeb later in the week to visit her father, Johnny Abbott. About two hours later on Wednesday and a few hours before her close family started looking for her by posting a missing person bulletin on various social media platforms, she was tracked at a service station in Windhoek where she had a fierce argument with another woman. This confrontation that bordered on all out violence was captured on closed circuit television cameras. Over the past weekend and during the police investigation, the footage from the fuelling station in Pionierspark was compared to the footage from security cameras at the Merensky Towers to see if it was indeed Abbott who had left her car in the parking structure of the building before leaving a letter for her friend and instructions for employees of the hotel at the reception desk to contact the friend, Windy Engelbrecht, with whom she was sharing a house, to pick up the silver Golf after 10:00 on Friday morning. Witness accounts obtained from two security guards at Merensky Towers over the weekend, after her body was discovered, stated that Abbott on Thursday afternoon sat in her car for about an hour before she gave one of them some cash to go and buy her an airtime voucher for her phone and a bottle of Coca Cola. She left the parking structure, went to the reception to leave instructions and the letter at the reception desk and then boarded a taxi with which she travelled to the Game Shopping Centre which is situated a few hundred metres away from the Marigold Hotel where she was employed as a food and beverage manager until the end of February this year. CCTV footage from another building near the scene where her remains were found confirmed that she walked down the incline towards the tracks at around 17:30 on Thursday afternoon. An eyewitness account from another security guard corroborated the footage and stated that she was seen sitting next to the tracks near a storm water culvert at around 17:40. The last time she was active on her cellular phone was on Thursday at 17:36 when she used her WhatsApp messenger application. According to Joe van Zyl, a close family member and an employee of TransNamib, he heard about a fatal train accident in Windhoek when he arrived at work on Friday morning. He said he immediately went to the scene of what he still thought was an accident. “On my way there my wife called me and said that she saw on various social media platforms that my niece’s decapitated body was found next to the railway line. I did not immediately make the connection but it soon dawned on me that the accident I was going to investigate to determine TransNamib’s possible culpability in the incident might be the exact same thing. Although I had some time to prepare mentally, I was still very much overwhelmed to find my niece’s remains on the scene,” he said. Forensic and medical experts said the lack of blood on the scene can be explained by spasms of the veins in a traumatic amputation, as well as the body position that was in an incline position. Van Zyl said that the position in which her body and separated head was found made him think that someone else had a hand in his niece’s death. “My emotional state and my close relationship with Elna-Marie forced me to suspect the worst possible scenario,” he said. He said that Abbott was sent to a psychiatric clinic in South Africa during May 2018 because she suffered yet another emotional break-down and that she was suicidal at the time. According to van Zyl, his niece was forced out of her job at Erindi in the first half of 2018 because of her affair with a married woman. The Erindi owner, Joubert, denied knowledge of the affair and insisted that he still does not know why Abbott left as she was an exemplary employee. “She came back from the clinic in South Africa and within a day she attempted to commit suicide by swallowing 300 sleeping tablets. Her life was saved by a text message she sent to her sister who suspected the worst and went looking for Elna-Marie. She was found in a comatose state and rushed to the Lady Pohamba private hospital where emergency procedures saved her life. My niece spent the next three weeks in a coma in hospital and when she eventually woke up she came to stay with my wife and I until she felt well and strong enough to move out on her own again. It was the only time she ever attempted suicide,” said Van Zyl. Van Zyl said although his niece did not work for the entire month of March, she again found love and happiness. “We were actually rooting for her because she seemed happy and could not stop talking about her new girlfriend. Little did we know that her new girlfriend was already in a committed relationship with another woman,” he explained. Van Zyl said the argument caught on camera at the service station earlier in the week occurred between Abbott and another woman who was in a committed relationship with a female medical doctor. He said both the medical professionals were ruled out as possible murder suspects. One of the women could also be tracked and her alibi proved water tight. The doctor was in South Africa and only returned to Windhoek a day after Abbott’s death. The initial investigation found threatening messages on Abbott’s phone. These messages were sent from a South African mobile number used by the medical doctor while she was in the neighbouring country. The messages did not contain any death threats but Abbott was instructed to leave the doctor’s girlfriend alone and that some violence might ensue if she did not. This created the impression that a man was responsible for the threatening messages at first. In a bizarre coincidence, Abbott was working at Erindi in 2015 when the 24-year-old Tania Kruger committed suicide by shooting herself in the head with a .38 revolver while still in the employment of the well-known Erindi private game ranch. Van Zyl said during the reconstruction of the scene where Abbott’s body was found, detectives determined that she went to the tracks and sat there for about three hours. She smoked a few cigarettes and swallowed tranquilising tablets. “Three trains passed the scene where she was found. Two trains passed on Thursday evening and a third train at about 04:00 o’clock on Friday morning. The driver of the fourth train was the first to see her body next to the tracks at about 07:00. It is suspected that the first train that travelled in a southerly direction at around 20:00 on the evening of Thursday 27 March was responsible for the decapitation,” he said. According to Van Zyl, the train that severed his niece’s head was running in a southerly direction towards Rehoboth while the driver of the train that discovered her body was travelling in a northerly direction towards Windhoek. This led to some initial confusion because her head was laying in a southerly direction from her body but the driver of the last train on Thursday morning was travelling north. The driver of the last train suspected that he was responsible for the death at first. Besides being involved in lesbian love triangles, the deaths of Abbott last and Tania Kruger about four years ago had some similarities. In both cases, the women ended their lives in an extremely violent way which is not normally associated with suicide amongst females. The fact that both women left several suicide notes addressed to different people in their lives is also an eerie similarity. Kruger left seven notes and letters while ten notes and letters were found in Abbott’s silver Golf. According to Kruger’s family, none of them have ever seen or read what was written in her seven letters. They were informed that the letters were still with the police at Omaruru. In the meantime, Abbott’s family are still busy with funeral arrangements. Her younger sister, Elzane, indicated that Abbott will be laid to rest next week and that final arrangements will be announced soon. Previous : Auto Rent – Clearance Sale!